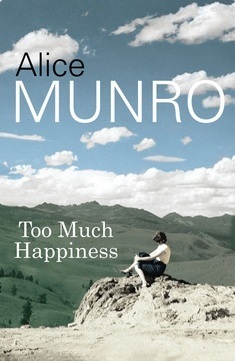 Was it prescience or serendipity that we happened to be reading Too Much Happiness by Alice Munro in the very month that she won the Nobel Prize for Literature? At all events, this formal international recognition of her talent lent an extra spice to our discussion of the master of the short story, often described as Canada’s Chekhov. As we seldom read short stories, we began by examining in what ways the short story is distinct from the novel, noting how they differ in length, pace, plot and in the manner in which the characters that populate them are revealed to the reader. And in the course of this, we agreed that Too Much Happiness is by no means a typical short story, and not typical of Munro, either. We have a presentiment of death in the first short section of the story: Sophia is walking in the snow, in a cemetery in Genoa with her fiance, Maxsim. She tells him that one of them will die during the year “because we have gone walking in a graveyard on the first day of the New Year.” A few days later, with the onset of a very sore throat, she begins a long journey back to Stockholm, where she has a university lectureship and where her little daughter, Fufu, is waiting for her. By this time we have already learned that Maxsim is envious of Sophia’s success – she won an important prize for mathematics a year ago – and decamped from the champagne receptions in her honour back to his home in the south of France; after the celebrations she went north to Sweden, to her lectures and her daughter just as she is doing now. But this time she has his promise of marriage in the spring. On the journey to Paris, in a dream flashback to 1871, we become acquainted with her sister Aniuta, now dead, Aniuta’s husband Jaclard, a Communard, and Sophia’s own husband Vladimir who, at no little personal cost, had rescued Jaclard when he and his fellow revolutionaries were captured. When Sophia reaches Paris she visits Jaclard and her nephew Urey and is dismayed by their attitude to Aniuta’s memory and to herself. She knows she will not see them again. And now, shivering with cold and her sore throat she is on the train for Berlin and the home of her old mentor Weierstrass and his sisters. And we are, before and after this last, sad visit to the old man, made aware of how she and Vladimir parted, and of the circumstances of his suicide. Sophia is persuaded by a young doctor, on the last stage of her journey, to change her ticket so as not to go through Copenhagen, where, he says, there is a smallpox epidemic. The appalling ferry trips and freezing local trains are to be her undoing, the damage to her fragile health slightly mitigated by taking the tablet the doctor had given her. Arriving in Stockholm, she insists on giving her lecture, going to a party, walking in thin slippers in the snow, and finally collapses at her home where a few days later, she dies. A very short piece of literature, and a confusing one, many people felt; the difficulty of distinguishing flashback from the present journey. But most of us were in favour of it, raising a silent toast to the success of this eminent writer. Next month, it’s J.G.Farrell’s Troubles.